Ignition Casino Poker is available in Australia & the USA. Cashier includes debit/credit cards and crytocurrencies. Play Texas Hold'em at Fixed Limited & No Limit tables. Play poker tournaments and Sit & Go's on your phone. Ignition Casino Poker is the only major poker room that still welcomes real money poker players from both Australia and the United States of America. As part of the enormous PaiWangLuo Poker Network, you won't just be playing against fellow Aussies or U.S. citizens, you'll also be playing against Canadians and real money poker players from Latin American countries like Argentina, Brazil, Mexico and Colombia. For Australian and US-based poker players who enjoy playing poker while out and about, Ignition Casino offers an iPhone and Android version of their online poker site. It's a web-based app, meaning you do not have to download or install any software to your iPhone. It will also work on Nokia Lumia phones or Android devices, such as a Samsung Galaxy, HTC, Motorola or Sony Xperia. To obtain the Ignition iPhone Poker app, don't head off to iTunes, as you won't find it there. Instead, just open up your iPhone web browser and head towards WWW.IGNTIONCASINO.EU. The software needed to play the game will download to your iPhone and install within the browser. At the moment you can only play Zone poker plus Texas Hold'em , Omaha (Hi) and Omaha Hi/Lo cash games. Tournaments are in the pipeline. 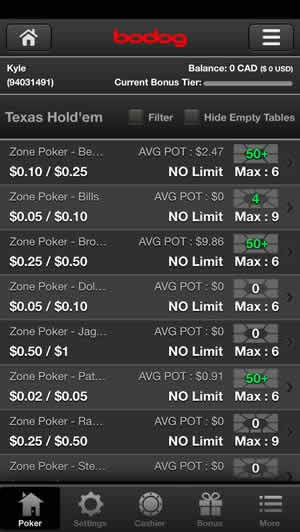 Zone poker is Ignition's version of the “turbo” poker games that are becoming increasingly popular, much, perhaps, to the disdain of the poker purists. 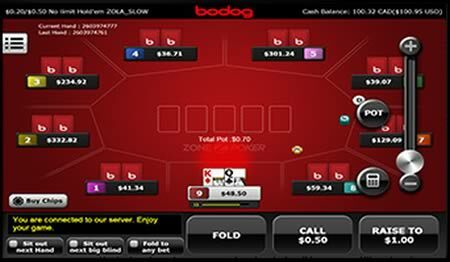 In Zone poker, you do not have to hang around waiting for the next deal because as soon as you fold at one table, you're sent automatically to a new table where the deal is about to start. This of course minimises the time you spend waiting for decent hole cards to turn up, but also completes eradicates the important poker concept of position, as your position at the table changes randomly with each hand. 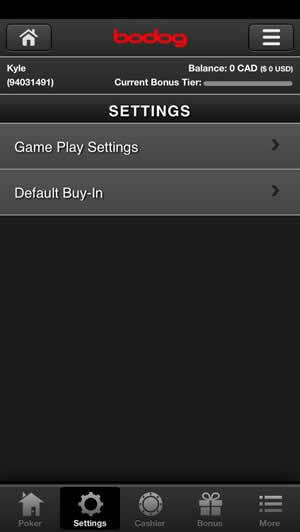 The latest version of Ignition poker now includes Sit & Go tournaments and scheduled tournaments that can be played from any iOS or Android phone or tablet. If you've played at Ignition via their poker client, you'll recognise the “table” display instantly. While other poker clients insist on creating a genuine poker-like atmosphere with at least some kind of graphic depicting a table or at least the surface of a table, Ignition simple splits the screen into “zones” (hence, we assume, “Zone” poker) in a honeycomb pattern. Each player inhabits their own zone and the cards, the dealer and blinds buttons and their stack all appear in their specific area. Another thing that might furrow the brows of poker purists is that fact that at Ignition poker, names are not used, and neither are avatars. Each player is represented by a single digit number which depends upon their position at the table. This does lead to an uncluttered display which works well on the iPhone's screen, but will not delight people who know the importance of understanding who you are up against so you don't end up as bait to the sharks, plus, if you're something of a shark yourself, you won't know who are the tastiest fishes until they start endlessly chasing gutshot draws. When it comes to playing the game, the gameplay is very sleek, and very fast, probably because there's not much in the way of moving parts. When it's your turn to act, three buttons appear at the bottom of the screen: Fold, Check/Call (or just Call if you've been raised) and Raise. The value of Raise is always set to double the value to call, but a slider appears on the right hand side of the screen if you don't want to blindly double the call value all the time. The slider does take a little bit of getting used to, but is something that you need to master if you're going to be playing seriously for cash. 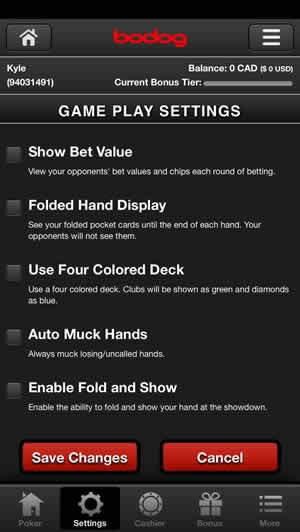 As well as the action on the poker table, you can manage aspects of your account from the app, and it allows you to open an account with Ignition if you don't already have one. The Cashier option from the main screen will also allow you to deposit and withdraw funds from your account. 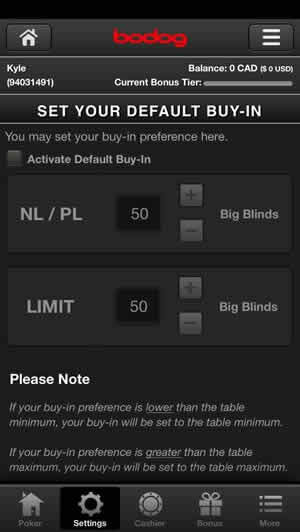 Ignition Poker now also supports bitcoin deposits and withdrawals and the fees are free. If you do not have an account with Ignition you can claim a 100 percent bonus up to $1,000 when you join. If you claim the full $1,000 you will need to earn 5,000 “Poker Points” during the first sixty days of your membership. You earn roughly one Poker Point per $1 of rake you generate, and three for every $1 you spend in tournament fees. Australian and US-based poker players don't have much of an option when it comes to online poker at the moment, so they're probably going to be pleased with any online poker playing they can get their hands on, especially when playing poker away from their PC or laptop. 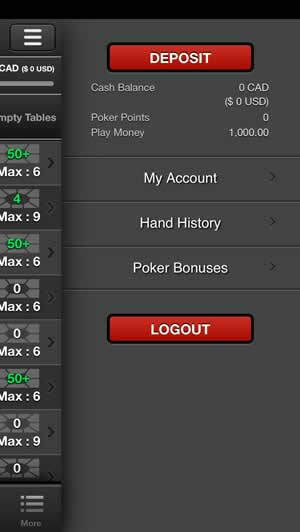 The Ignition iPhone poker app has been very nicely designed, and the play is speedy and smooth. Both high-speed and regular poker games are currently available. The recent addition of MTT's and Sit & Go tournaments have really made this a world class mobile poker room. The more recreational player is likely to be delighted by the app though, especially by the fact that you can play for “play money” or “real money”. If you're a recreational poker fan who likes to play poker just to while away a little time when you're sitting on the train or waiting in the car for your kids to finish soccer practice, then you're likely to judge Ignition's iPhone poker app a winner.